I didn't think it was possible for me to be pissed off about a game I expected to lose, but here we are. The Braves shouldn't have lost this one, but we had a down game from our usually stellar bullpen, and we couldn't put together the strings of hits we needed to take a lead. I won't trash Venters for a bad game because the kid is so solid normally, he will just bounce back. I will beat up our hitters because there are a couple of guys who really need to get into the groove when it matters against these divisional teams. Once again the RISP hitting is causing us problems. This was the bane of our existence last season, and it's starting to rear it's head here at the end of April/beginning of May. Phillies went 4/9 with RISP, we went 1/6. That's your ballgame in a nutshell. I could end the blog entry right there and you would have a pretty solid idea that we lost this game. 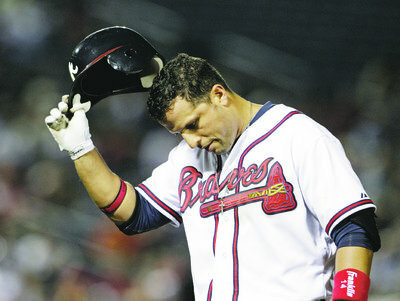 Pastornicky, Francisco, Uggla, McCann, and Freeman all had chances to take this game over, and none of them came through. Also, despite McCann's solo shot in the 4th, he rapped into a rally-killing double play after Freeman singled in the 8th. If we can just get a hit there, Uggla came up and singled right after that, and Diaz walked. So many chances were wasted because we didn't have good situational hitting. The simple fact of the matter is that Juan Francisco can't replace Chipper Jones. We need Chip in the middle of the lineup in these games in order to produce some action on the ball. Also, we can't have our hitters get aggressive in the wrong places. Example: Bottom of the 6th, no outs, runners first and second. Uggla swings at the first pitch and misses, then pops up the second pitch to the first basemen, moving nobody over. Bear in mind, Hamels had just WALKED the catcher. He was obviously wild, and Uggla still went up there hacking at bad pitches. That kind of impatience made the first out a very unproductive one. What makes it worse is that Diaz singled right after that. Instead of knocking in a run, it loaded the bases, and instead of Francisco's sacrifice plating just one run, we could have had two runs and the lead. All because Uggla was aggressive in the wrong place, and didn't give any situational movement to the runners. Also, what in the hell was up with the defense we were playing against Hunter Pence? He hit one of the laziest grounder singles I've ever seen in my life through the middle of the 1st to 2nd gap because we had him played in some ridiculous shift. I don't know what the computers are telling you, Fredi G, but try not to out-think the room, buddy. There's no reason to shift the infield all over creation against a guy who knows how to slap bunt the ball. Pence had two hits in the game, and they were both critical. Your shift was dumb. STOP IT! Onward and upward to the game tonight. I really really REALLY hope Chipper can go, because he's batting .538 against Halladay in his career. No, I'm not making that up. He's 7/13 lifetime against Doc with 2 HRs and only one strikeout. Uggla is 10/25 against Halladay lifetime, so look for him to finally cash in for the series. Also, BMac is 7/20 for a .350 average against the Ace. Were I setting a lineup, I'd want BMac, Uggs, and Chipper my 4-5-6 murder's row to really put the hurt on Halladay. Let's hope Fredi G has a good handle on the numbers and Chip's knee isn't holding him back.